This procedure is usually performed in patients who lost a significant amount of weight. Following weight loss, the skin of the thighs (especially inner thighs) may remain stretched and loose. 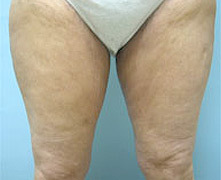 During a thigh lift, skin excess is removed which improves the shape of the thighs. Some patients choose to undergo abdominoplasty and thigh lift at the same time. An inner thigh lift is more commonly performed that an outer thigh lift. Incisions for an inner thigh lift are placed in the groins or along the inner side of the thighs. The exact location and the length of the incision will depend on the amount of skin excess to be removed. During your consultation, we will discuss in detail the location and length of the incision and resulting scar with you. We place a small drain in each thigh to prevent fluid accumulation during the initial healing process. The drains will be removed within 7-10 days after the procedure. You will be given a compression garment that needs to be worn for 3-4 weeks after surgery to ensure adequate healing.